Testing construction materials to BS 476 Parts 6 & 7 at Bodycote Warringtonfire UK. Propogation of flame when in contact with a 500 ºC wall of fire. In order to meet a standard materials cannot burn pass the first marker. The Auspreg™ 986T prepregs achieved the highest ratings for fire testing on building materials and structures after independent testing to BS 476 Part 6 (Class 0) and Part 7 (index 1) by Bodycote Warringtonfire in the UK. Materials meeting BS 476 parts 6 and 7 are widely used for manufacturing interior parts for commuter mass transit that are designed to resist lateral spread of flame and propagation of flame when in contact with radiant heat or actual fire. According to Australian Composites, manufacturers of fire resistant parts for trains, trams and buses have until now only had the option of using epoxy or phenolic resin systems. These have short shelf lives, require refrigeration in shipping and storage, and must be cured under heat and pressure for up to 8 hours in autoclaves. Auspreg 986T prepreg does not need any refrigeration, it can remain useable at room temperature for over 12 months, and it cures in a matter of minutes per layer using artificial or natural sunlight. 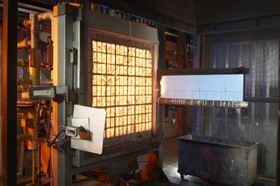 The materials can also be cured in multiple layers in a one step process for thicker or stronger parts. “By utilising our rapid light curing prepreg technology with flame resistant properties, we have succeeded in producing a more economical, easier to handle, and time saving option that will likely be of great interest to the global composites industry,” Leipnik notes. Auspreg 986T prepreg is available in most glass types (E, C and S), various fibre weaves (uni, biax, CSM, triax, etc) and in finished weights ranging from 300 g/m2 to 3500 g/m2. Specialist composite prepreg producer GMS Composites has developed a flame retardant (FR) epoxy prepreg with increased toughness and a shorter gel time. Adhesives specialist Intertronics has launched its new Dymax BlueWave MX-150 LED UV spot curing lamp.